Perhaps your summers are spent in the mountains and on hiking trails in nearby woods and their associated colors are your favorite for your summer scheme. From rock and stone covered with lichen and moss, to woodland ground with ferns and wildflowers, to grays and browns of tree trunks, to the many greens of coniferous and deciduous shrubs and trees – always a reminder of nature, these colors are restful and serene. As you can see from the above photos, there is an incredible richness of colors in nature. Depending on where you live or where you are hiking at the moment, there is so much variety in rock alone – from various shades of gray to pink, orange, brown, black and even nearly white. The same is true for greens. We stock over 70 shades of various green wools alone – from palest pistachio and apple, to rich dark emeralds, olives, brownish greens, yellowish greens, bluish, greenish or grayish sage greens, dark to light. 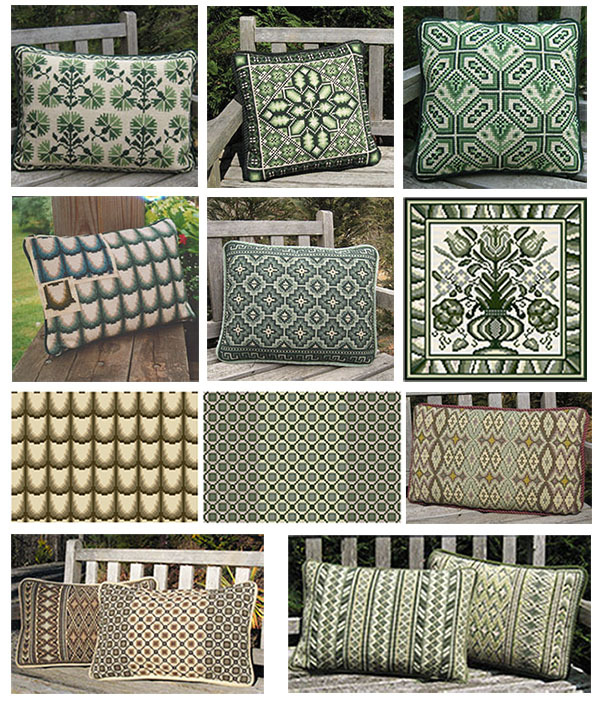 At cross-point™ we offer a large variety of patterns for stitching your favorite summer colors of pure greens, sage greens and brownish greens. 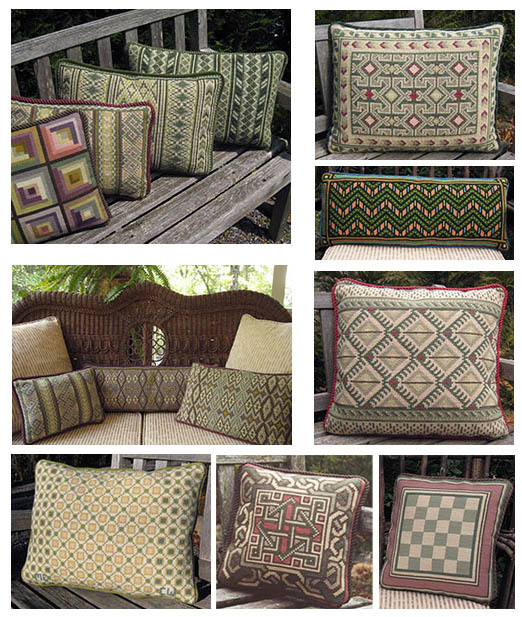 Nearly all of the cross-point™ pillows shown above are available in a number of sizes from squares to oblong lumbar (back) pillows and all of them are available for custom coloring. Several lend themselves for upholstery for chair seats and backs, stool tops, ottomans and a few are also available as rugs. Our PARMA pattern is ideal for side and armchairs, seats and backs. Our 12th Century Geometric pattern can be used anywhere since it is a small pattern and is also quickly stitched and easily changed to other colors. Meadow, Pisac and Turin are also ideal for upholstery and our pattern Balouch is available as a long, narrow piece that can be used as a table runner or to go on the back and seat of a wing or club chair. Please refer to the website pages for more detailed information.